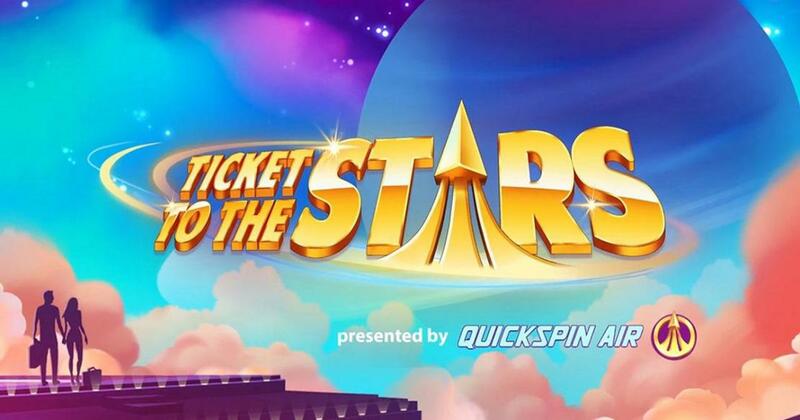 Space travel is a real thing in Ticket to the Stars, a Quickspin slot machine that’s dedicated to the space industry’s quest to make commercial flights possible. It’s a game that will mix real world events and technology, with the potential future, and it comes from Quickspin. Commercial space travel is not a thing yet, but we’re very close to that moment, and Ticket to the Stars is a slot machine which explores that very topic. We have pilots and stewardesses that serve on space ships, though they mostly wear the outfits that you’d see in airplanes as well. Besides the pilot and the stewardess, other symbols shown on those reels range from futuristic backpacks, to robots, champagne and various colorful diamonds. If you look beyond the reels, you see a spaceship in vertical position, ready to take off. It’s got a modern design, as expected since it’s a release from Quickspin. 25 bet lines are provided, on the 5×3 reels that the game uses. It’s also a slot with free spins that get an unlimited multiplier meter, along with Swooping Reels, scatter symbols and wilds. The 10,000x the stake potential payouts ($1,000,000), along with a 96.52% RTP should give you an idea of what kind of experience you can expect from it (obviously, it’s got High volatility). As expected, for 25 lines you are going to use 25 coins, and the betting range can vary between $0.25 and $100. This gives you the option to select bets of up to $4 per line. First, you can count on the game delivering Swooping Reels whenever winning combinations are formed. This feature is similar to the cascading reels from other slots, so it removes winning positions and brings new symbols in. The Wild logo is one of the feature symbols that you should look forward to. It pays up to $2,000 for its own combinations, and it helps others as well, as a replacement. Bonus Rocket icons will be scatters here, and through them you can trigger 15, 20 or even 25 free spins. You get an increasing multiplier here, which goes up by 1x after every three winning spins. Each time this happens, you also get 2 extra free spins. There is no limit to how high this multiplier can get. Ticket to the Stars has excellent graphics, huge potential and it can be a lot of fun, particularly for the players that enjoy higher volatility in their slots. Try of out a demo version of Ticket to the Stars.